00:00:13.16	of Texas MD Anderson Cancer Center in Houston. 00:00:16.22	And today I'm going to be discussing how the cell cycle is regulated. 00:00:44.17	and yeast, and even plants. 00:00:46.13	So, let's get started. 00:00:54.00	and this will be the topic of our first lecture. 00:01:00.24	machinery to bring about cell cycle delays. 00:01:03.22	And I will define what checkpoints are. 00:01:17.05	and checkpoint control to selectively kill cancer cells. 00:01:21.13	So, we're going to begin with the history of the cell cycle. 00:01:24.23	And so, here, we'll be discussing these disparate organisms. 00:01:32.24	this is great for biochemistry. 00:01:53.11	the cell division cycle. 00:02:02.10	of... of mostly human cells and mouse cells. 00:02:12.11	cycle, and that's a... that's called mitosis. 00:02:16.10	And what you can see here, on this slide, is a depiction of the root of an onion. 00:02:22.13	And this is a highly mitotic organ. 00:02:40.19	of threads in division. 00:02:58.07	You begin to see the chromosomes condense into these thread-like structures. 00:03:10.07	that's known as anaphase. 00:03:12.03	And in the panels labeled E, these are two daughter cells that have completed mitosis. 00:03:23.09	which are illustrated here. 00:03:31.09	to condense and the nuclear envelope dissolves. 00:03:38.20	on the metaphase plate. 00:03:40.23	And then, in a process known as anaphase, those sister chromatids are pulled apart. 00:03:49.16	to form two independent cells. 00:04:01.12	nondescript phase called interphase. 00:04:27.14	the roots of those plants with radioactive phosphorus. 00:04:31.08	And what they observed is that DNA synthesis occurred in a very discrete period of time. 00:04:37.04	And so, this was called S phase for DNA synthesis phase. 00:04:47.16	and this is how it remains today. 00:05:11.08	the completion of DNA synthesis and the commencement of mitosis. 00:05:15.16	Again, this is very descriptive. 00:05:19.01	Scientists really wanted to know, what were the key molecular drivers of this process? 00:05:29.24	from interphase through mitosis? 00:05:32.14	And then, very importantly, what prevents the cell cycle from moving backwards? 00:05:37.07	That would be a disaster. 00:05:45.15	where they began to tackle this question. 00:05:53.13	synchronize them at different phases of the cell division cycle. 00:06:09.20	blocks to going backwards in the cell cycle. 00:06:12.09	So, take for example the top panel. 00:06:21.16	S, and G2 phases of the cell cycle, and they'd fuse them to a mitotic cell. 00:06:33.21	that would drive cells in earlier stages of the cell cycle into mitosis. 00:06:40.22	So, they called this an M-phase inducer. 00:06:47.13	to an S phase cell. 00:06:49.15	What would happen is the G1 cell would prematurely enter into S phase. 00:06:59.15	along into S phase. 00:07:07.14	that to a G2 cell, the G2 cell would not re-replicate its DNA. 00:07:21.07	the cell cycle would move forward. 00:07:22.21	So, this said there was some active factor that blocked re-replication. 00:07:34.01	and Johnson found when they fused a mitotic cell with a G1 cell. 00:07:51.10	they're sort of like skinny spaghetti cells. 00:07:54.17	If you look in the middle, this is fusing an S phase cell with a mitotic cell. 00:08:03.19	replicate its genetic material, and now you've fused it with this dominant M-phase inducer. 00:08:13.12	you'll get an S phase catastrophe. 00:08:15.15	And you'll hear later... we try to do this, now, to kill cancer cells. 00:08:31.00	the chromosomes have already replicated. 00:08:38.04	descriptive information, but what are the key players that are driving us into mitosis? 00:08:44.04	What is this dominant M-phase inducer? 00:09:02.00	at different stages of development. 00:09:16.24	G2, or at the egg phase cell, which is arrested in mitosis. 00:09:21.04	And so this was a wonderful way to do some biochemistry. 00:09:29.00	you can get huge amounts of this material for biochemistry. 00:09:40.10	arrested at the G2 phase of the cell division cycle. 00:09:43.23	The natural hormone that will then mature this oocyte into an egg is progesterone. 00:10:00.03	egg, which then is ready to be fertilized. 00:10:02.23	And the egg is arrested in metaphase of meiosis 2. 00:10:06.14	So, you can think of this as a pure population of interphase (G2) cells and mitotic cells. 00:10:35.13	into a new oocyte. 00:10:37.18	And that new oocyte would mature into an egg. 00:10:40.23	And they could do this repeatedly. 00:10:49.05	being dragged along in the pipette. 00:10:51.22	You actually were generating this dominant M phase factor. 00:11:01.18	the oocyte into an egg. 00:11:09.17	in many different organisms. 00:11:16.12	cells, and even yeast. 00:11:22.13	to M-phase promoting factor. 00:11:44.19	to try to purify this M-phase promoting factor. 00:11:57.01	would do was to isolate cytoplasm from activated frog eggs. 00:12:02.12	And so, when you activate a frog egg, it will leave mitosis and go into interphase. 00:12:31.02	in vitro, out of the organism. 00:12:38.17	would go through several rounds of mitosis, and then interphase, and mitosis, and interphase. 00:12:46.17	So, now we come to how MP... the MPF was purified. 00:12:51.13	Here, what you see is a picture of the frog. 00:12:53.08	They... you can collect beakers full of eggs. 00:12:56.13	And this is what the Maller lab did. 00:12:59.08	And so you induce that frog to lay eggs and you crush the eggs to make soluble extracts. 00:13:04.10	You then fractionate the egg extracts using a variety of different biochemical techniques. 00:13:33.16	and ask, which ones will drive this interphase cell into mitosis? 00:13:39.24	And so, doing that, the scientists, then, the Maller group co-purified two proteins. 00:13:46.19	So, two proteins co-purified with this M-phase activity, M-phase promoting activity. 00:13:53.04	One protein was 32 kiloDaltons in size; the other was 45 kiloDaltons in size. 00:14:05.12	the scientists liked to use at that time was histone H1. 00:14:08.12	So, this activity would phosphorylate this substrate in vitro. 00:14:20.00	to really figure out what this 32 kD and 45 kD proteins were. 00:14:31.00	available databases, and in short order you would know what these proteins were. 00:14:35.19	But, back in 1984, we didn't have this technology. 00:14:38.23	And so, this basically sat here for a while. 00:14:47.03	you to remember what we talked about because we'll come back to it. 00:14:55.04	to describe the discovery of a very important protein. 00:14:59.09	And these are the cyclin proteins. 00:15:07.17	function of the cell cycle -- you can see them rising and falling, okay? 00:15:18.06	with S-35 methionine to label all new proteins. 00:15:22.12	Most proteins just rise linearly across the cell cycle. 00:15:34.07	they were named cyclins. 00:15:46.05	up in the next interphase, and you see them disappear. 00:15:49.15	And that's why they were named cyclins. 00:15:59.13	cyclins and inject it into a frog oocyte. 00:16:03.21	Recall, that oocyte is arrested in the G2 phase of the cell cycle. 00:16:14.00	able to get this oocyte to mature into an egg. 00:16:17.01	So, that said cyclin was important for the process. 00:16:35.08	with an enzyme called RNase. 00:16:38.16	And so this will destroy all of the RNA in the cell. 00:16:41.12	Then, they inhibited that RNase activity with an enzyme called RNasin. 00:16:47.00	And then they could take cyclin mRNA and add it to the extract. 00:16:51.10	And so, now, this is the only messenger RNA present, okay? 00:17:02.11	into a mitotic cell. 00:17:03.23	So, this said that cyclin was sufficient to do that, within the context of this extract. 00:17:24.06	phase was dominant to all other states. 00:17:34.20	with two proteins, a 45 kD protein and a 32 kD protein. 00:17:39.20	And this activity was high in mitosis and low in interphase. 00:17:49.22	sufficient to drive mitotic entry. 00:17:53.05	So, I want you to remember all of this, because we're going to come back to that. 00:17:57.03	But now we're going to turn to the yeast, okay? 00:18:04.14	have evolved as far from each other as we have to yeast. 00:18:09.01	But they... and they provide scientists with unique opportunities to do genetics. 00:18:22.09	genes that are important for regulating the cell division cycle. 00:18:39.01	divides by binary fission, and spends most of its life in G2. 00:18:48.16	that can move a cell from G2 into mitosis. 00:18:51.22	So, here's the life cycle of a fission yeast. 00:19:02.13	double in size, divides by binary fission. 00:19:05.03	So, the two daughter cells are equal in size to the original parental cell. 00:19:10.04	Now, here's an example of a cdc mutant. 00:19:13.07	This mutant continues to grow, but it cannot divide. 00:19:23.03	these yeasts wouldn't live. 00:19:31.21	would be larger than the original parental cell. 00:19:40.03	cell cycle forward -- it's a positive regulator of the cell division cycle. 00:19:50.23	it the cdk1, and it's a protein kinase. 00:20:11.12	histone H1, in vitro. 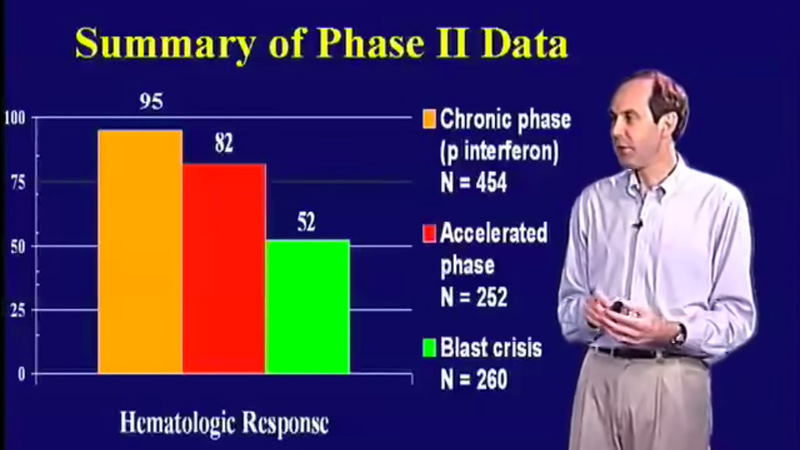 00:20:13.10	And they then showed that the kinase activity was high in mitosis and low in interphase. 00:20:26.13	there's a kinase activity there, this kinase can phosphorylate histone H1. 00:20:36.05	we're going to tie together. 00:20:37.23	So, how did scientists do that? 00:20:48.20	in the Xenopus partially purified MPF prep. 00:20:58.09	showed it recognized the 45 kD protein in the partially purified MPF prep. 00:21:07.11	took a fission yeast reagent to precipitate out clam MPF. 00:21:21.21	And so, we come now to the unification model. 00:21:24.17	So, in yeast, that was the identification of the protein kinase, cdc2 or cdk1 in humans. 00:21:40.00	the MPF that we... was first biochemically purified in frogs. 00:21:45.08	So, MPF is a heterodimer between a protein kinase and a regulatory subunit, a cyclin. 00:21:53.02	And these are the gentlemen that did the early and seminal discoveries in this field. 00:22:22.04	He was responsible for identifying a lot of the key G2 regulators. 00:22:36.12	and come in with a human cDNA library. 00:22:39.17	And he could rescue this phenotype in yeast. 00:22:41.24	So, it shows how conserved all of these genes are. 00:22:46.03	You can take a human gene and complement for the loss of cdc2 in fission yeast. 00:22:56.03	in Medicine and Physiology for this discovery, for their discoveries. 00:23:01.20	So, now, let's turn to the regulation of cdc2. 00:23:13.00	and then it becomes inactivated as cells exit mitosis. 00:23:16.04	So, how does that happen? 00:23:22.12	that the cdc2 protein levels are actually constant throughout the cell cycle. 00:23:32.00	But, recall... look at its activity. 00:23:39.00	enter mitosis, and then it drops away. 00:24:03.17	But this is not what we see. 00:24:12.00	there's no activity of cdc2. 00:24:35.11	to drive cells into mitosis? 00:24:37.05	So, again, we come back to fission yeast. 00:24:44.21	cells are equal in size to the original parental cell. 00:25:03.23	then we have other types of mutants. 00:25:07.03	These are wee1 mutants. 00:25:14.23	And so the progeny are actually smaller than the original parental cells. 00:25:18.20	So, this was called a wee mutant because of the reduced cell size. 00:25:22.13	You're gonna see this is also a protein kinase. 00:25:30.16	slow down the cell cycle -- it's a... it's a negative regulator of the cell cycle. 00:25:48.09	protein kinases and protein phosphatases to regulate it. 00:25:59.17	the B-type cyclins begin to accumulate in mid-S, and they immediately bind to cdc2. 00:26:07.19	This heterodimer is not active. 00:26:31.07	and that's an activating phosphorylation. 00:26:34.01	But this is the form of the kinase that accumulates throughout interphase. 00:26:41.00	phosphorylated on these inhibitory sites. 00:26:43.23	Then, a protein phosphatase known as cdc25 dephosphorylates the complex. 00:26:49.02	This is what we call active MPF. 00:26:52.12	It's bound to cyclin and it's phosphorylated on that activating site. 00:26:57.12	So, this is how cells then move from interphase into mitosis. 00:27:02.13	Now, how do cells get out of mitosis? 00:27:05.01	Recall, there's a precipitous drop in activity as cells exit mitosis. 00:27:09.05	And that's because the cyclin is degraded. 00:27:13.01	And the cyclin is degraded through a process called ubiquitin-mediated proteolysis. 00:27:31.18	And now you return cdc2 to its monomeric, inactive form. 00:27:45.04	this now prevents the cell division cycle from moving backwards. 00:27:55.12	lecture was focused on the cdc2 protein kinase. 00:28:26.10	for multiple Cdks to regulate different cell cycle transitions by the cyclin they bind. 00:28:46.22	to treat human cancers. 00:28:48.10	So, thank you for your time. 00:00:13.12	MD Anderson Cancer Center. 00:00:15.14	And in lecture 2, we're going to be expanding on what we talked about in lecture 1. 00:00:20.00	So, in lecture 1, we learned about the cell cycle. 00:00:27.02	of cell cycle control to targeted cancer therapies. 00:00:31.01	So, in the first lecture, we talked about how the cell cycle is regulated. 00:00:40.09	cycle machinery to bring about cell cycle delays, and I'll define checkpoints. 00:00:58.07	So, let's think about the problem. 00:01:00.17	Our human genome contains three billion base pairs of DNA. 00:01:13.00	20,000 proteins that make up the 200 different types of cells in our body. 00:01:23.11	and ultimately form the complete human body. 00:01:27.15	And our adult human body is estimated to contain approximately 50 to 75 trillion cells. 00:01:48.24	during each cell division cycle over our lifetime. 00:01:52.17	And we're living to a hundred years now. 00:01:54.24	So, the question is, how do cells accomplish this amazing task? 00:02:08.00	and one consequence of this is cancer. 00:02:11.10	So, let's take an example. 00:02:13.24	We're all used to living in a world with sunshine. 00:02:16.24	So, what happens when you're out in the sun? 00:02:19.12	Well, the sun emits UV radiation and this UV radiation can penetrate our skin cells. 00:02:27.13	What happens then is mutations. 00:02:29.14	So, UV radiation can interact with our DNA and create DNA mutations. 00:02:48.11	to repair those mutations. 00:02:50.16	So, think about... many of you have been out in the sun and gotten a sunburn. 00:02:55.21	So, what is a sunburn? 00:03:05.05	better for me to die than to compromise the entire organism, which is us. 00:03:17.08	known as programmed cell death. 00:03:20.15	The second way cells can respond is to undergo a process known as cellular senescence. 00:03:32.13	still active, and they still secrete things. 00:03:50.23	about cell cycle delays, or makes the cell cycle stop at different stages of the cycle. 00:03:58.07	Now, what happens during this time? 00:04:15.18	daughter cells upon division. 00:04:17.16	And, again, one consequence of this is cancer. 00:04:26.18	do not appropriately repair the DNA damage after this type of exposure. 00:04:35.18	cancer arises from the accumulation of several alterations in the cells of our body. 00:04:46.19	up the tumor microenvironment. 00:04:50.00	And so, what do all these mutations do? 00:04:52.13	What these mutations do is to change critical cellular pathways in our body. 00:05:05.08	that will sustain its proliferative capacity. 00:05:20.18	a cell to cell death. 00:05:22.16	You find mutations in genes that enhance mobility and invasiveness. 00:05:32.09	at the end of this lecture. 00:05:39.17	another tissue, it must gain the capacity to move and invade. 00:05:52.04	that are important for angiogenesis. 00:06:10.14	wants to, again, mutate those genes. 00:06:13.04	And it wants to evade immune destruction. 00:06:15.24	Think about a tumor growing in your body. 00:06:37.18	able to recognize and then kill that tumor. 00:06:42.08	But what tumor cells do... they're very tricky. 00:06:44.10	They figure out ways to not be recognized by our immune system. 00:06:57.09	And they want to sustain their cell cycle progression. 00:07:06.07	this is the concept of checkpoints. 00:07:08.15	So, what are checkpoints? 00:07:10.14	So, checkpoints, again, are basically signal transduction pathways. 00:07:37.12	cell cycle and not move into S phase. 00:07:45.23	new replications of origin. 00:07:52.11	to segregate that mutant DNA to the two daughter cells. 00:07:57.11	And so those are checkpoints that respond to DNA damage. 00:08:24.15	anaphase until that happens. 00:08:31.01	checkpoint in this lecture. 00:08:34.17	Its goal is to stop the cell cycle at these various cell cycle phases. 00:08:45.14	by a family of cyclin-dependent protein kinases. 00:08:52.04	remember, this is the master regulator of mitosis. 00:08:55.07	It must be activated to drive cells from G2 into mitosis. 00:09:06.13	This is important for early cell cycle transitions. 00:09:18.13	to bring about cell cycle delays? 00:09:21.12	So, what needs to happen is the cell needs to turn off the cell cycle accelerators. 00:09:27.19	So, who are these cell cycle accelerators? 00:09:30.24	Well, these are some of the same proteins we talked about in our first lecture. 00:09:42.07	have a key activator which drives the cell cycle forward. 00:09:46.23	So, a normal cell wants to turn the activity of these enzymes off. 00:09:53.06	In addition, a cell wants to turn on the brakes. 00:09:56.22	And so, what's an example of a cell cycle brake? 00:10:08.05	This protein is a transcription factor. 00:10:16.07	which are effectors of p53. 00:10:19.09	And they then interact with the Cdks to inhibit their activity. 00:10:25.13	In addition, there are two additional brakes, Chk1 and ATR. 00:10:31.12	These are both protein kinases. 00:10:41.17	it for ubiquitin-mediated prote... proteolysis. 00:10:45.15	So, Cdc25A becomes degraded. 00:10:54.18	their progression, turn on their brakes. 00:10:57.08	The ATR is also a protein kinase, and it directly phosphorylates and activates Chk1. 00:11:10.09	and accelerators, and how we might begin to target these for cancer treatment. 00:11:15.02	So, let's think about adding a Chk1 inhibitor to a normal cell. 00:11:20.08	So, a normal cell has an intact p53 pathway. 00:11:24.22	p53 is absolutely essential for cells to stop in the G1 phase of the cell cycle. 00:11:38.05	of the cell cycle. 00:11:50.11	G1, and there is a p53 pathway that helps to reinforce the S and G2 checkpoints. 00:11:59.12	And so normal cells, under these conditions, can respond to this inhibition. 00:12:03.18	But what about a cancer cell that doesn't have p53? 00:12:13.12	of the cell cycle. 00:12:21.16	of the cell cycle. 00:12:22.19	So, if you come in with a Chk1 inhibitor, now you lose all of your brakes, okay? 00:12:38.23	So, again, let's come back. 00:12:52.17	because the p53 pathway is disrupted. 00:12:56.16	Now, cancer cells however, still need brakes. 00:13:02.06	And so let's take an example of a stop sign. 00:13:11.22	and it will stop. 00:13:22.06	Now, a tumor cell, under normal circumstances, can get away with running a stop sign. 00:13:29.01	However, if a Mac truck is coming in the other direction, that cancer cell needs to stop. 00:13:49.07	that DNA before moving forward. 00:13:51.24	So, using this as a rationale, clinical trials have been started in patients. 00:14:18.18	given antimetabolites, these induce DNA replication stress. 00:14:23.03	So, all of these chemotherapies in the clinic will induce DNA damage. 00:14:28.03	And most cells of your body will respond by stopping. 00:14:31.18	However, a cancer cell, like we mentioned, doesn't have p53. 00:14:35.24	And so it's going to not be able to stop in G1. 00:14:51.13	to preferentially kill p53-deficient cancer cells. 00:15:00.21	Washington University School of Medicine. 00:15:02.23	And 25 patients with a variety of metastatic cancers were treated. 00:15:07.00	And they were given a DNA damaging agent, in this case, irinotecan, with a Chk1 inhibitor. 00:15:43.09	we have targeted therapies for them as well. 00:16:07.18	2 patients with the partial response and 2 patients with stabilization of disease. 00:16:18.21	able to show that the tumor response correlated with p53 status. 00:16:23.04	So, in other words, if the tumors had a mutant p53, they responded to this therapy. 00:16:35.24	her tumor was positive for p53, wild-type p53, and that tumor did not respond to the therapy. 00:16:43.02	Here's just an example of one of the patients. 00:16:52.23	and after three cycles of treatment a dramatic loss of that tumor to her chest wall was seen. 00:17:10.19	to understand how entry into mitosis is regulated. 00:17:20.00	fundamental concepts using frogs, and sea urchins, and yeast. 00:17:30.03	regulators that we've identified and characterized in the field. 00:17:34.13	These drugs are now in clinical trials in patients. 00:17:37.04	And we use many of them in my laboratory in preclinical studies. 00:17:42.00	But I want to quote Socrates. 00:17:46.05	And what Socrates says is, "The only true wisdom is in knowing you know nothing." 00:17:50.10	And what I mean by this is, you know, I am a basic discovery scientist. 00:17:54.08	I am not a clinician. 00:18:03.05	to patients, it was my first experience really working with humans as a model organism. 00:18:14.19	with humans as we like to do in the laboratory. 00:18:29.10	and some perhaps with vehicle. 00:18:31.03	But you know we can't do that with patients. 00:18:47.12	when we treat it. 00:19:00.00	that we like to do as scientists? 00:19:06.11	models are called patient-derived xenograft models. 00:19:22.06	special mice, which lack immune systems. 00:19:29.16	system will attack that as a foreign body. 00:19:32.01	So, we need to work with special mice that lack certain components of their immune systems. 00:19:38.03	And so this is how we do the experiments. 00:19:40.12	What we first do is we humanize the mouse mammary gland. 00:19:44.11	So, how do we do that? 00:19:51.03	so we take her normal mammary fibroblasts and we immortalize those cells. 00:20:32.04	these organoids, and we then put them into these recipient mice. 00:20:41.19	these tumors ad infinitum for all the types of scientific studies we want to do. 00:20:47.01	And here's an example of what some of these tumors look like. 00:20:49.19	So, here, they've been implanted into the mammary gland and we've pulled the tumors out. 00:20:54.03	So, now we have a lot of material to answer the questions that we want to answer. 00:21:10.15	human because we can take a human-specific antibody and we can then probe this tissue. 00:21:17.18	And so anything in brown is human. 00:21:19.17	So, you can see, here, a human tumor in the lung of this mouse. 00:21:24.00	All of the blue is the mouse lung tissue. 00:21:27.19	So, now, we can set up what we call preclinical trials in mice. 00:21:41.06	if they work in the mice. 00:21:47.19	from two different patients. 00:21:56.09	was mutant for p53. 00:21:58.13	We engraft those tumors into the mice and then we set up big cohorts. 00:22:13.13	agent, another cohort of mice with the Chk1 inhibitor, and then let's do the combination. 00:22:18.15	And let's actually look to see how these tumors respond. 00:22:22.06	So, here's one example. 00:22:31.20	there... it's growing at the same rate, no matter how we treat the mice. 00:22:36.01	So, that was the p53 wild-type tumor. 00:22:40.01	In this set, we have the mice engrafted with the p53 mutant tumor. 00:22:45.12	So, the red and black lines are superimposable. 00:22:53.18	with the Chk1 inhibitor. 00:22:55.02	So, there's no difference there. 00:22:57.02	But if we treat with the DNA-damaging agent, you can see a slight slowing in tumor growth. 00:23:08.01	slowing of growth of the tumor. 00:23:13.16	fell off the animal. 00:23:14.17	Now, this translates into improved lifespan. 00:23:17.09	So, again, the top group is a... the mice engrafted with the p53 wild-type tumor. 00:23:23.06	No matter what we treat those mice with, it doesn't extend the lifespan of these mice. 00:23:28.16	But look at down here: this is a tumor that was mutant for p53. 00:23:39.02	somewhat, and the combination therapy even more. 00:23:49.16	status does help predict how these tumors are gonna respond to this combination therapy. 00:23:55.01	So, now let's move to metastasis. 00:24:10.19	of the human body: the brain, the lung, the liver, and the bone. 00:24:15.04	Now, this is what ends up killing patients. 00:24:24.05	tumor and women will be fine. 00:24:26.10	But it's when the tumor moves, this is ultimately what kills our patients. 00:24:37.19	So, what is the metastatic cascade? 00:24:40.13	Well, a tumor originating in the breast has to change and get certain properties. 00:24:52.01	So, they need to be able to invade and move throughout the body. 00:25:21.24	that organ, and be able to grow. 00:25:30.14	So, we, again, can use these mouse models to study this process. 00:25:40.09	the patient, and we're able to express a gene encoding firefly luciferase. 00:25:51.23	tried to capture them. 00:25:54.00	Fireflies have an enzyme that basically can emit light. 00:26:12.17	and then we can monitor metastases. 00:26:21.22	you can see the tumor has moved to the lung and up to the brain. 00:26:32.08	bioluminescence in the lung, in the liver, in the bone, and the brain. 00:26:45.05	to the same places that a human tumor would metastasize in a patient with breast cancer. 00:26:52.04	So, we're... have a great model, now, to try to dissect that. 00:26:55.13	So, what do we do? 00:27:02.24	take these tumors out of the brain, out of the lung, out of the mammary gland. 00:27:14.04	in these metastatic lesions, relative to the mammary gland from which they came? 00:27:20.10	We can ask, what genes are expressed at higher or lower levels? 00:27:24.09	We can ask, what proteins are more or less abundant? 00:27:27.12	And we can ask, what proteins have been turned on or turned off? 00:27:31.19	And then we can ask, are these differences targetable? 00:27:34.18	Do we have drugs that we can now use in these mice to try to treat these metastatic lesions? 00:27:49.22	of these pathways, to try to target these metastatic lesions. 00:27:58.05	I am a discovery scientist. 00:28:15.16	master regulator of mitosis, is regulated. 00:28:29.16	to bring about delays. 00:28:38.16	we could then begin to understand how cancer cells derail these pathways. 00:28:48.04	preclinical trials, and then ultimately we come back into the lab from what we learned. 00:28:53.24	And so it's bench to bedside and bedside to bench. 00:29:04.24	impacting patients with the cancer problem. In her first talk, Dr. Helen Piwnica-Worms provides a historical perspective on cell cycle regulation and outlines important experiments in frogs, clams, and yeast that revealed crucial mediators of the cell cycle. Scientists observed that there were factors that allowed cell cycle progression, while there were other factors that prevented the cell from going backward. Using these model organisms, scientists were able to characterize the activation of the inducer of mitosis, the M-Phase promoting factor, which is a heterodimer between cyclin-dependent kinase (Cdc2/Cdk1) and cyclin B. In her second talk, Piwnica-Worms explains how scientists have used their understanding of the cell cycle regulation to generate targeted cancer therapies. The cell has proteins that serve as cell cycle checkpoints, which allows the cell to respond appropriately to DNA damage. Although not all of the checkpoints are functional in a cancer cell, these cells still need the checkpoint proteins to respond to DNA damage. Piwnica-Worms’ laboratory studies the use of combining DNA damage agents with checkpoint inhibitors to selectively kill cancer cells. Her laboratory developed a patient-derived xenograft mouse model to study Triple Negative Breast Cancer (TNBC), and predict how the genotype of the tumor affects treatment.